‘Mobile web is top of the funnel, mobile app is bottom of funnel’ says Fred Wilson, prominent VC and thought leader, in his latest blog titled, well ‘Mobile web is top of the funnel, mobile app is bottom of funnel’. He refers to the latest Comscore US Mobile App Report which has some interesting stats comparing mobile web and mobile app usage in the US. As the author rightly points out, the data may be skewed since the report talks only about the US, the inferences still are worth taking a note of. The US seems to stil lag behind when it comes to the transition to mobile apps. The eastern markets have been much quicker to adopt mobile apps, moving on from mobile web. The largest e-commerce players in markets like India, China, Japan and other south east asian countries generate more than 60% of their revenue from the app. There are some companies which have completed migrated to apps and closed down their desktop and mobile websites as well. In this article though, Fred Wilson talks about how it is easier to attract traffic to the mobile web than the mobile app, simply because users directly land on a brand’s mobile web site before having to install the app from the app store or playstore. Thus, the mobile web for a user is like window shopping before he or she enters the store and buys something. 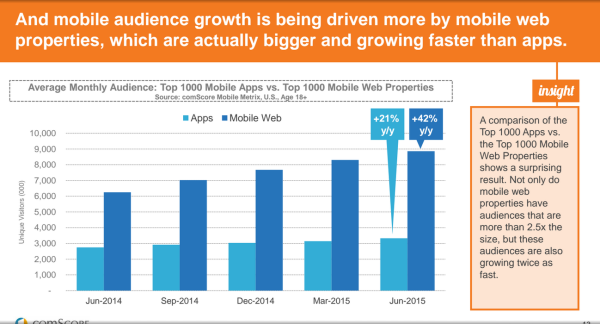 This graph from the Comscore report shows the average monthly audience to mobile web is 2.5 times more than that to the mobile app. The data includes the top 1000 mobile web properties versus the top 1000 mobile apps. 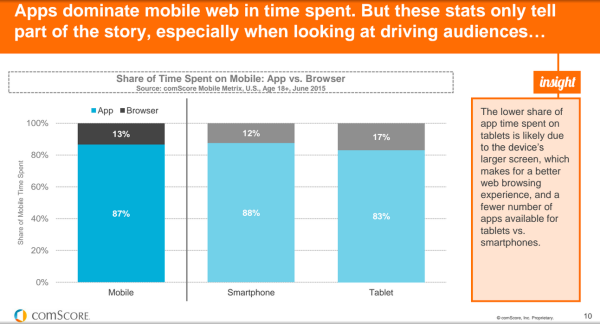 On an average, users spend more than 80% of their time on the mobile app. This stat is consistent with other markets. This clearly means that user experience is critical for a brand to retain app users and prompt them towards a transaction. Having a massive install base is good, but it is not going to mean anything to your business if your users are not coming back to your app. There are a million apps out there crowding the market and people are spoiled for choices. The only way you are going to stand out is by personalizing the experience of your app users. Consumers now expect a brand to know where they are and what they want. And especially when it comes to a very personal device such as the mobile phone, they love it when you personalize your messaging and offerings. Mobile marketing automation platforms help you with understanding user behavior data, segmentation and then customize messaging across channels such as push, display, social media and email. If you are not working with one already, it is high time you did. Write back to let me know your thoughts. I would love to hear them.